The connectivity service provides access to the network with a symmetric and guaranteed bidirectional capacity to the system of research networks and the Internet. The project will offer two profiles of access to the network: basic and advanced. The basic profile, designed for schools and other entities with limited bandwidth needs, such as branch offices of research institutions, libraries and university spin-offs, provides for the creation of a fiber optic link in a single way between the site user and an aggregation sitestrong>, in turn connected to the GARP PoP. This mode will offer capacities from 100 Mbps to 1 Gbps. The advanced profilestrong> is designed for large users of the research and education community, such as research centers and universities, characterized by high network requirements and provides for the creation of a direct fiber-optic link between the user's site and the PoP GARRstrong>. Depending on the needs of the connected site, the connections can be made in protected mode, ie by laying a pair of fibers on different routes. The capacity of the access circuits available for this type may vary, depending on the needs, from a minimum of 100Mbps up to multiples of 10Gbpsstrong>, with the possibility of easily upgrading in case of increased bandwidth requirements. For all users of the network, the GARR NOC (Network Operations Center) service is available, which is responsible for the management and operation of the network infrastructure, handles fault management, activating new connections, collecting and publishing statistical traffic data. L3-VPN: Level 3 virtual private networks built using IP / MPLS technology. eduroam (Education Roaming) is a service that provides secure access to the wireless network. Users visiting roaming at an institute that joins the initiative are able to use the local wireless network (WLAN) using the same credentials (username and password) that they would use in their own institution, without the need for further formalities at the the host institution. IDEM (IDEntity Management for federated access) aims to provide simple and secure access to online services and content between different organizations. Thanks to the federated system, users of the institutions that subscribe can access the various resources with the same credentials through a single standard authentication procedure (single sign on), without renouncing the confidentiality of personal information and the security of resources, which only the authorized persons can access. The IDEM Federation participates in eduGAIN, the interfaederation promoted by the GÉANT project, which allows to extend the benefits of single sign on federated at European and global level. GARR Certification Service, which issues digital certificates to people (to sign and encrypt documents) and servers (to protect links and certify the veracity of a site). GARR Vconf, multi-conference service to put audio-video communication up to 80 locations using the most common hardware and software clients, today also in the HD version. NRENum, which offers a public numbering space accessible via IP to institutions of the GARR community using VoIP. CERT has the task of assisting GARR users in managing IT security incidents and carrying out preventive measures necessary to reduce their risk. SCARR allows technical contacts to perform vulnerability tests on the machines of the GARR network and obtain a detailed report on the problems encountered and possible solutions. 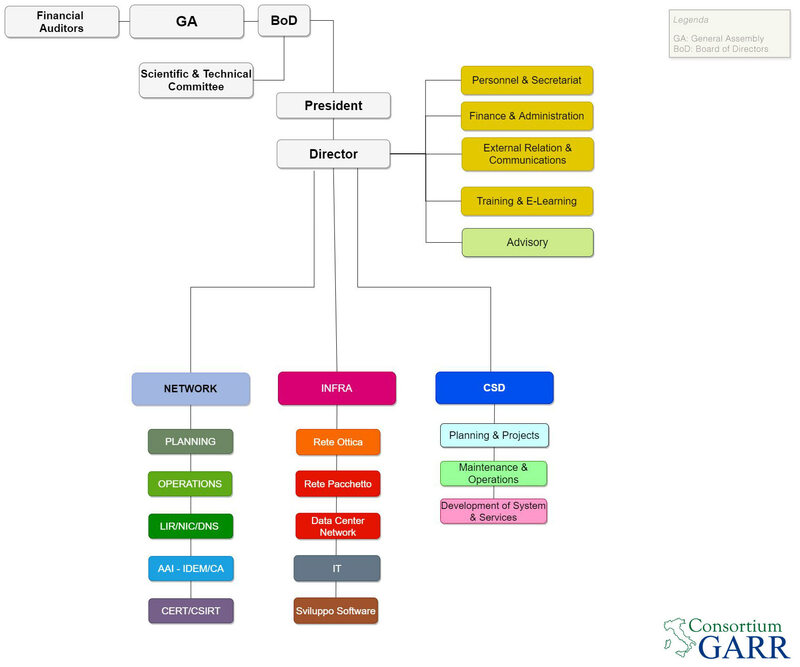 GARR LIR (Local Internet Registry), which manages the assignment of IPv4 and IPv6 addresses to institutions in the scientific and academic community. GARR NIC (Network Information Center), which manages the assignment of new names under the .it and .eu domains for all users of the GARR network. GARR Mirror, about 240 TB dedicated to the distribution of the most used public software available on the net. Through GARR-X Progress, users can use infrastructures and software in a simple, flexible and on-demand manner according to the Cloud paradigm. Access to cloud services, typically in SaaS mode, will mainly be delivered through IDEM federated identities. Some of these services, such as FileSender, are included in the access to the GARR network, while others will be charged, according to pricing models that adapt to the needs of users. Personal Data Storage - GARRbox, intended for individual teachers and receptors, who can securely store and share files with their colleagues. Filesender, a web application that allows users to easily and securely send large files to any recipient, obviating the limits usually imposed on e-mail. Smart: includes only the IdP, provided in PaaS mode in the GARR cloud. This service, obtained by combining the Virtual Server and Big Data Storage services, allows to replicate the data and applications of institutions or individual usersstrong> (such as DNS, institutional WEB, user database, Mail Server, data backup, etc.) on the Cloud platform , ensuring high redundancystrong> thanks to a configuration without single points of failure and an overabundant sizing.